Hello everyone. It is time for another kit reveal. I’m so excited to introduce you to our July Kit: Pool Party! We hope you find this kit splashin’! Now lets set the mood. I love how fresh this mood board is. What are your favorite elements you see above? Now how about some sneak peeks? Here is a few images from our July Main Kit. Of course you can’t leave without seeing some images of our July Travelers Notebook Kit. To inquire about subscriptions, please email us at info@cliquekits.com. Kit Reveal Day: Don’t forget to join us for the full reveal on Wednesday, June 21. I will be doing an unboxing of the kits LIVE Facebook video (you can always watch later if you don’t join in live). Categories: mood board, Prom Committee | Tags: card making, clique kits, July 2017, kit club, Kit Sneaks, paper crafts, planner, Pool Party, scrapbooking, Travelers Notebook | Permalink. Hello, my name is Lacey and I'm a Graphic Designer and love to craft! 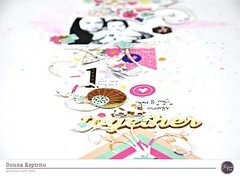 I am a co-founder of Clique Kits; a scrapbooking kit club. Thanks for checking out my blogs! What an awesome mood board!!! I love the rainbow and you know I love the flair!!!!!! !